For the last four weeks we have shared with you our organizing tips about sorting, identifying categories, maximizing your use of space, and putting things away in their proper homes. Some people say the hardest part of organizing is letting go of things. Cable TV shows have families put all of their belongings on the front lawn and return only 1/2 to their homes. Organizing 4 U believes you should part with items which are no longer useful to you and no longer bring you joy! How does one decide? Try sorting items in each space into 3 piles – trash, keep and donate. Share items you no longer need with those who do. Try keeping a donation bag or box handy and add to it on an ongoing basis – the next time a charity calls for a neighborhood pick up, you will be ready! Look at all of the items the homeowner let go of!!!! 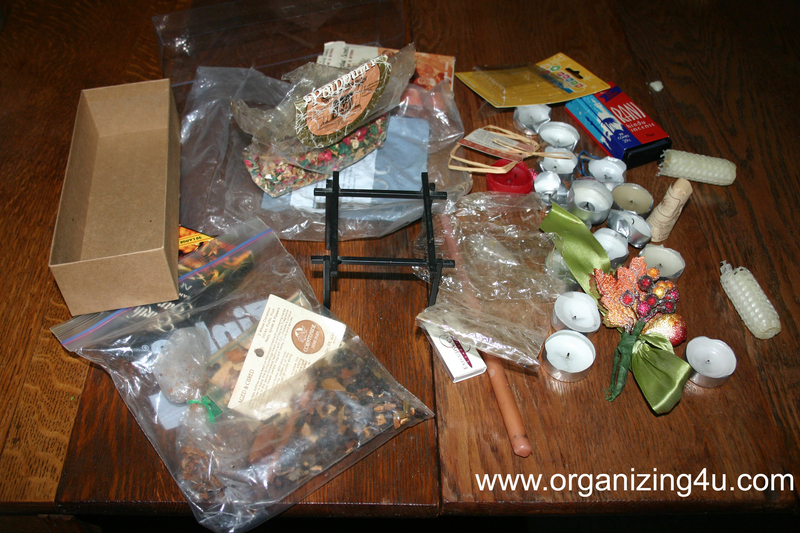 We see broken and mostly used candles, potpourri, a candle stand, a box, incense, ribbon, etc. How did they ever find a candle in there!!??? What interesting items have you found when cleaning out a drawer or cupboard?